Ok, so for the next 2 weeks it’s all things wedding for me. Steff is tying the Knot to her beau Ken on August 3 (I am her maid of honor, planner, designer and florist for this event – so I will be a very busy girl!). I shared a few posts with you already regarding planning and her bachelorette party. Now I would like to share with you one very SWEET gesture that was given to Steff for her shower, from someone she has never met! 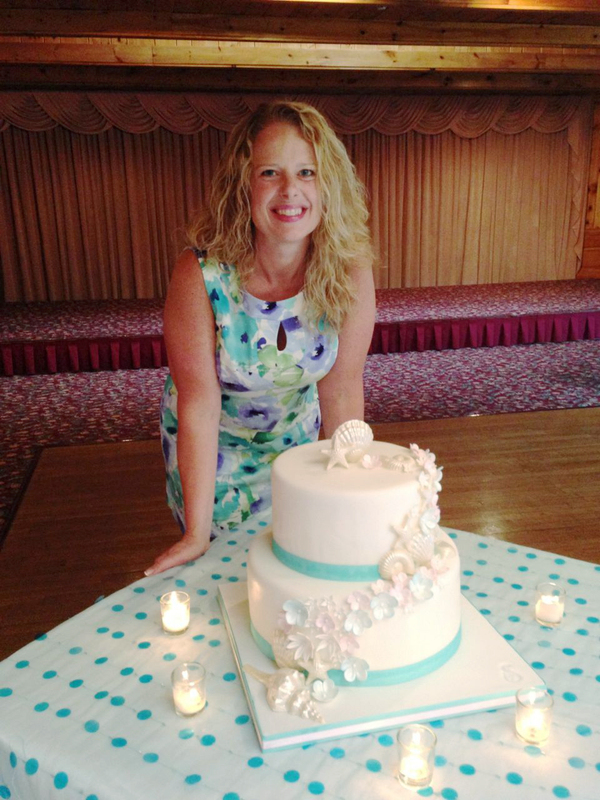 After I had posted in January about Steff’s wedding, I received a lovely comment from a reader and baker Elizabeth Houde of Sweet Tales Cake Boutique in Dracut, Massachusetts. I was so touched reading her comment! I have never been the inspiration for anyone’s business before and it was such an honor for me. AND an offer to make a special cake for Steff? I emailed her after her reading her comment and said that would be honored for her to make her bridal shower cake. At first we had setup a meeting for us to go in a meet with Elizabeth, but our schedules never matched up so we sent over Steff’s favorite cakes flavors and I sent the invite and shower theme over for inspirations and I asked Elizabeth to do what she does best and surprise us. Based on Steff’s love for Cape Cod and the beach, her friends and bridal attendants decided on a beach theme for her shower. 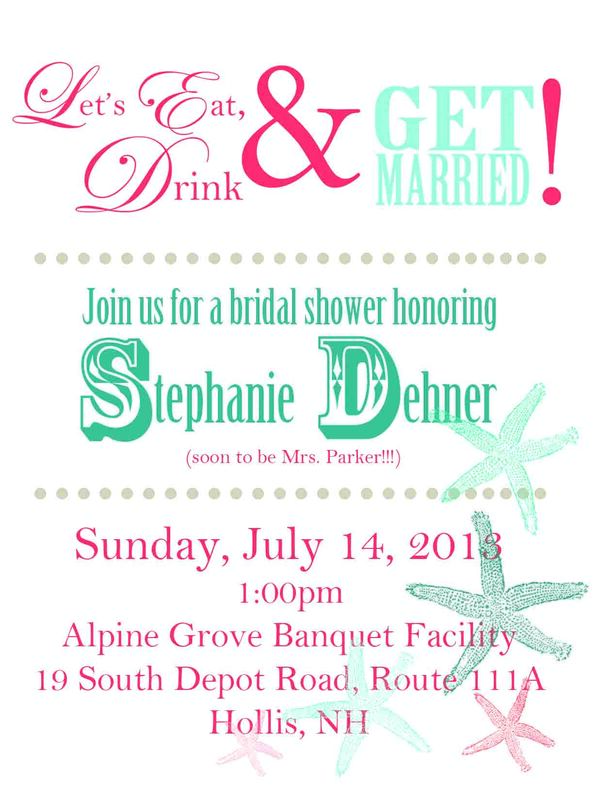 This was the invite I designed for Steff. And surprise us she did! Steff’s cake was AMAZING! I wanted to send a big THANK YOU out to the very talented Elizabeth for making such a lovely cake. I am hoping to meet with her during a visit to New Hampshire in the fall to do a proper post featuring her incredible talent and her bakery, so stay tuned! But in the meantime – this is my huge thank you for making Steff feel very special at her bridal shower! Here is the happy bride – my friend, sister and bestie, Steff and her beautiful cake. Elizabeth’s beautiful creation! It was chic, beautiful and executed so neatly! the colors were perfect and the guests’ said it was delicious. Please visit Elizabeth’s bakery by clicking on the photo. If you are ever in need of a delicious specialty cake for any event in the Southern NH and Boston area – I highly recommend this bakery. She is a delightful woman and has a passion for what she does. Again, thank you Elizabeth for making Steff’s day so special! Follow her on Facebook HERE. What a GREAT story, and what a GREAT CAKE!!!!!!!!!!! Hi Lisa – I agree! Steff’s cake was AMAZING!